New shoes at Mea Culpa!!! “Hawk”, the one you can see on the pic above is one of them. 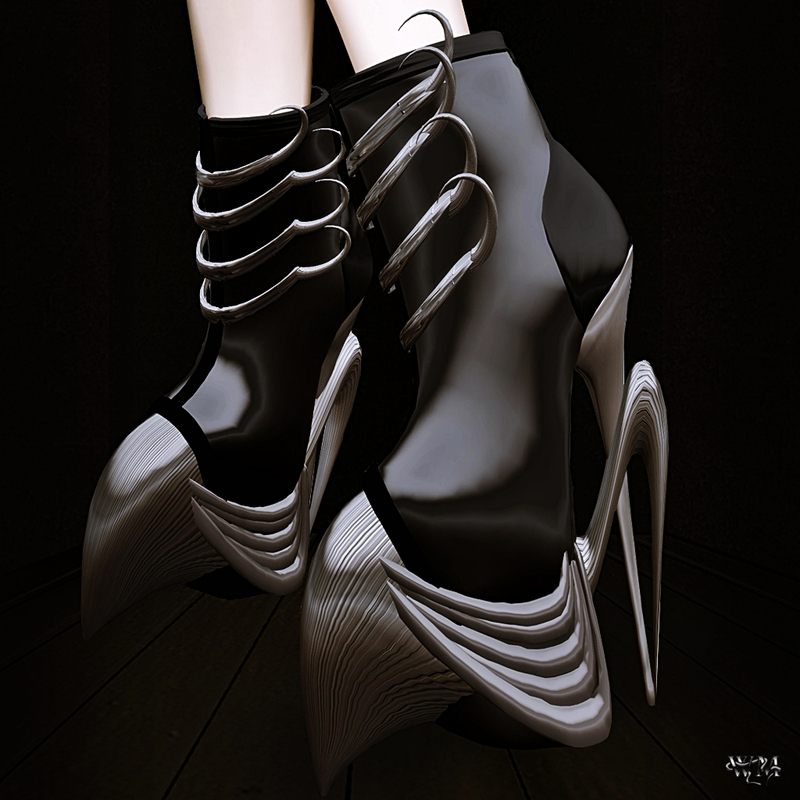 I guess the talons of a raptor could be the inspiration for this amazing pair of heels. The silver, metal and black totally underlines the strong vibe this new design has! The “Shanghai” shoes were/are part of the great winning gown “Shanghai Noon” that won the ‘One in a million’ contest a while ago. Now you can purchase those amazing pair of shoes single as well!!! I would like to call this heels as a piece of art. If you take a closer look at them, you can see all the awesome details like the flowers, the wonderful made textures and the special filigree decorated heels! This entry was posted in Fashion, New Releases and tagged 3D, 3D people, Art, Avant Garde, avante, Avantgarde, Ballroom, Blog, Blogger, claws, Clothing, Couture, elegnat, Fashion, Female Clothing, female wear, Formal, formal attire, hawk, heels, High Fashion, High Heels, male clothing, Mea Culpa, meta virtual, Model, Modeling, New, New Release, New Releases, News, one in a mission, photographer, raptor, Second Life, Secondlife, shanghai, SL, SL Clothing, SL Fashion, SL Style, Stilettos, Style, talon, Tatanka Kaligawa, Virtual World, Wicca Merlin, woman. Bookmark the permalink.